With the holidays behind us and spring coming up, it’s time to start planning that family spring break vacation. Unfortunately, vacations can be very expensive and are often out of reach for many families due to the expense. Families can still have fun vacations even if they’re on a budget. Some of my fondest memories growing up were our family vacations—and only once did that involve airfare. Due to the exorbitant cost of vacations and being a middle income family on a budget, my parents had to be creative with how we took our spring breaks. If you’re thinking that a vacation for your family is not in your budget, think again! Check out these ideas for spring break family vacations on a budget. Cutting out airfare is a great way to make a family spring break trip affordable. For the cost of a full tank of gas, you can take the whole family rather than paying for individual airplane seats. As for where to travel, the road is your oyster. I knew a family that drove from California to Florida for a spring break vacation at Walt Disney World. My family traveled up the coast from Southern California to San Francisco. Another family I knew drove from Los Angeles to Yellowstone National Park in Wyoming. Find a destination that your whole family can agree on, and decide to either take the family car or rent a camper. Everyone knows that after airfare, the most expensive part of vacations can be accommodations. So pitch a tent! Camping helps reduce costs because you can drive to your destination, and space rentals are usually very reasonable and affordable for a family spring break vacation. Just be sure to book your space with plenty of time as popular camping spots fill up quickly. Another bonus of camping is that you bring and cook most of your own food, which really helps in eliminating dining out costs. Your entertainment also consists of the great outdoors, whether that be swimming, hiking, or spending quality family time together around the campfire playing card games and making S’mores. If camping just doesn’t sound like a family vacation to you, try booking a place through AirBnB. For the same cost of a hotel room, you can rent a whole house! AirBnB allows you to rent homes, apartments, condos, or rooms within a residence from other homeowners across the country. It’s almost always going to be cheaper than staying at a traditional hotel or motel. 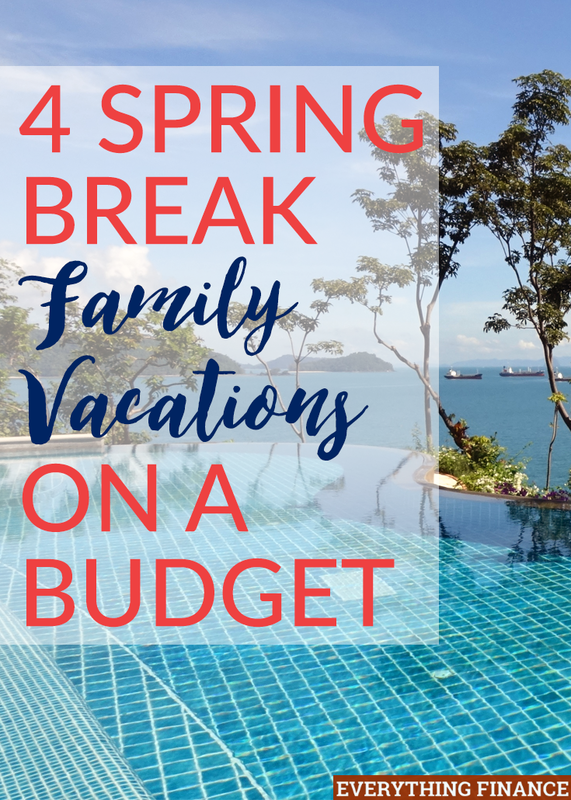 This also makes it easier to have a spring break family vacation on a budget, especially with children where having access to laundry facilities and a kitchen really comes in handy. If none of the above options sound appealing, consider giving your children a staycation. You can either stay in your own house and “camp” in your backyard, or simply rent a hotel for a night or two. I remember one particularly broke summer when my parents rented a night at a local hotel room. We packed our swim suits and spent almost the entire day at the pool. At night, we had takeout in our room and watched a family movie together. It was a short weekend, but it was enough to give us the impression that we were on “vacation.” We never even realized that it wasn’t a big vacation until we were older. The point is—everyone can use a vacation, and there are plenty of ways to fit one into your budget. What are some budget, fun, family-friendly vacations you’ve taken? Which one of these ideas is your favorite? Do you have any plans for spring break this year?